This entry was posted on Friday, 30 March 2012 13:55 at 13:55	and is filed under Iraq international relations, Sectarian master narrative. You can follow any responses to this entry through the RSS 2.0 feed. Both comments and pings are currently closed. Looks to me you made Maliki holding Iraq and Arab all together, which far been an arealistic assumptions. Salah, very briefly, the writer is ironic about the presence of some of the peripheral Arab African states and Kuwait at the Baghdad summit. He goes on to mock the leaders of Libya and Tunisia for supposedly compromising their legitimate mandates from the people. But that is precisely my point. Tunisian and Libyan leaders opted to ignore people like this writer (who has probably been pounding the same anti-Maliki message for so long that he is incapable of grasping nuances and shifts). Maybe it is the writer and not the Tunisian and Libyan leaders who is misreading public opinion? The writer also conveniently forgets Lebanese and Palestinian leaders who decided to attend the summit. Mockery aside, I did not see any favorable review of the summit except by Maliki’s supporters. Lets not forget that the summit has some value outside the Arab world (the US elections for example) and for the new regimes in Tunisia and Libya who may want to be treated in stately manner, but as far as reactions from inside Iraq, the street was and is strongly against it. Maliki is not street wise, the AL summit proves it and I think that the Kurds and Iraqiya are more in line with the people’s mood than in “growing irrelevance”. Faisal, I do remember there were reports of demonstrations in Falluja during the summit. These featured demands for greater “balance” in the state bureaucracy, which is a Kurdish demand embraced more recently by Iraqiyya. I think also possibly pro Syrian opposition. Were there other demonstrations elsewhere? Also, how do you explain the decline of the “Sunni federalism movement” which made so much noice last December? Surely, this isn’t down to repression by Maliki alone? Suggests to me that parts of Iraqiyya actually misread the street. Demonstrations against the AL summit is not the only sign of popular resentment, its not worth the hassle to demonstrate. Regarding the Sunni federalism movement, I always thought it is a none-issue, I mentioned this on your blog. Allawi wasn’t for it from the beginning and I think Nujaifi’s position was intentionally distorted and misinterpreted by Maliki’s camp. How can you say the Sunni federalism movement was a non-issue, it clearly was. Although Allawi may not have been for it, certain factions of the Iraqiyya bloc were. Also as a new visiter here and having read through some of the recent articles and comments I would just like to commend Reidar for great articles and unbiased ‘real journalism or blogging what ever you may call it. It is this kind of work that is very much void in the ‘popular’ always this country or that country driven media. As far as I see it the Arab League summit was a quasi-success even with the absentees and the somewhat weak results it had, as just the mere fact that it was held in Iraq is a success. Again it is really sad to see many Western news outlets deem it as irrelevant and having headlines like “Bombs blow through Baghdad as tensions escalate in AL summit” and other drivel when in fact there were only two IEDs that had one victim (a police officer) and the security was very much above the standard in everyday Baghdad. Really – you think the summit was a success?? I thought you had more acute insight than to conclude anything close to “success”, but alas, even you seem to be reading way too much into the empty words. Please tell me who beside the Emir of Kuwait that had any weight that attended and what are the great “decisions”…. Gimme a break. This is all much a do about nothing. Further, I wonder what Maliki gave to Kuwait to make him attend. Could it be a green light to go ahead and finish phase 4 of the new port? Observer, my point is, what happened to the Syria policy of the AL? It changed as the interventionist urge of Saudi Arabia and Qatar was replaced with something else due to their own low-level representation. Presence of Libyan & Tunisian leaders was also significant. With respect to Kuwait, if this was a prelude towards debt settlement then surely it was worth it? The writer said his view just like you , however the differences between the two not meant that one of them right and the other one wrong, thus you have your reasons to say so the other writer also have his reasons to say what he said, isn’t? I am still not convinced that Maliki skills as democratic folk, well organised and well understand his job and politic. His Daawa back ground heavily hold him more as Sec. folk than been a secular folk who looks for more bright futures. He can’t get off his believes and his grieving as Da’awa party member, they still living in their victimhood status they came to take revenge from Iraqis. As for the summit to me is a scenario set in Bagdad, has nothing to do with Iraqis or Arab as such. The differences huge between leaders and those new “Arab Spring” leaders are just find them self in the summit, they don’t have agenda, they don’t added any value to this gathering as they not raised neither as effective leaders inside their countries nor on the world stage. Everyone came have something personal more than What Arab Nations looks different aspects and their future especially in today changeling world. There are struggle on Arab land, there is no one direction that give any promises that those new leaders you mentioned their attendances is significant to the summit. As for Kuwaiti Amir as soon as he finished his speech he left to the US just was waiting for him many miles from his place without waiting to end of the summit. As you said his attendance was for “debt settlement then surely it was worth it?” I doubt they will satisfy with the outcome otherwise they should respond positively, Amir should been positive by bringing Clause 7 Iraq under? We got now Kurd movement which causing the top subject? Last thing looks Brett McGurk in Baghdad for more support to Maliki? 1- It was held, rather than postponed or cancelled like 2011. 2- No serious security disasters took place; all the delegates are safe. @ Salah: Sir, the link to the article you posted; that media organization is based in Doha, Qatar. If it said anything otherwise we would all be shocked. @ Faisalkadri: I imagine you are correct regarding the Summit viewed negatively viewed by the people. It cost over $1 billion, prices escalated, city was shut down, etc. and all for what? No real significant advance on any issue concerning the Arabs or the Iraqis, and of course no improvement in the issues that they are most concerned about; electricity, water, housing, etc. However, Iraq is in a superior position on the international stage as this is a demonstration of it being accepted back into the Arab World. I don’t know if that’s worth over $1 billion, but the price needs to be paid. @ Observer: you are absolutely correct in pointing out nothing of substance was arrived at in the summit. However, at what point in the Arab League’s 67 year history has anything of significance happened at the Arab League? It would have been highly unusual of something did happen. As for the states that sent low-level delegations, other than Egypt and Yemen who as Reidar stated have their own issues and if we exclude Algeria, all the remaining states are (in reality, whatever their constitutions say) Absolute Monarchies; the GCC, Jordan and Morocco. It demonstrates what shall likely be a future axis if Libya, Egypt, Tunisia and Iraq sort themselves out; Democracies Vs. Monarchies. P.S. Bahrain sent it’s Foreign Minister, though. Regarding Syria policy, the major cause of change is Russia’s veto, whatever happens in the AL is only an echo. Non-issue doesn’t mean nobody is talking about it, it means when somebody is talking about Sunni Federalism they mean something else. It seems that you all are measuring the success of the AL summit only by the fact that it was held on time. 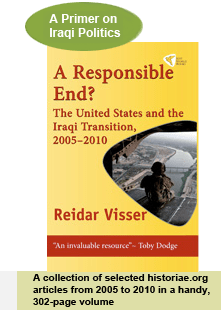 Seerwan seems to predict that Iraq is “being accepted back into the Arab world” while Reidar points out that GCC states and Algeria are not showing acceptance by their leaders absence. Guys, there is a lot of imagination in interpreting success of the summit. I say what really matters is popular perception, and as they say, perception is everything. Next drama. Wait for barzani to come back and watch syria. Electricity is going to bad this summer so lets see the de,ocratic maliki deal with peaceful demonstrations of his own. Rv did you miss the great attack on the communist part headquarters and the confiscation of weapoms of terror???? Nine years ago, who would have thought the Arab League would have been issuing a declaration extolling Bush/Blair’s freedom, democracy and social media agenda in Baghdad, of all places? When Amr Musa was welcomed to Baghdad in January last year (only last year!) “by a procession of three speakers supposedly representing Shiite, Sunni and Kurdish interests, followed by a Christian” (as it was derisively described here) who would have thought that within 9 days (9!) Mubarak’s regime would fall apart and 14 months later Musa himself would be running for president of Egypt? Who would have thought then such a summit would be hosted by a shiite prime minister of a co-sociational democracy in Iraq? Truly historic days. Heros: Iraqi people, Iraqi political leaders 2003-12, prime minister Nuri al-Maliki, former president George W Bush, former UK prime minister T.Blair. I am aware of that as always especially with this little sheikh who came to power after cue against his own father that talking big you all know why and what behind them. In same talk’n I see more in that regards when it comes to Iraq and Maliki promoting his as a democratic intelligent a leader for new Iraq, while Da’awa ruling Iraq telling they are miserably leading Iraq for the past three terms. With respect to Iraq and AL summit, there are only 2 GCC countries that really matter at the present moment—Saudi Arabia and Kuwait. The rest are all second tier. Maliki’s trip to Kuwait, and the Kuwaiti Emir coming to Iraq was a resounding victory for Maliki anyway you cut it. Kuwait has the most leverage when it comes to lifting chapter 7 status for Iraq, so if Maliki can get Iraq back to full sovereignty, I cannot see how anybody could discount that achievement. Certainly, things seem to be moving in the right direction with Kuwait. I can only imagine how ticked off Saudi Arabia and Qatar must have been to see the Kuwait emir in Baghdad. The other missing player of course was Saudi Arabia. You can’t fault Maliki for the fact that the Saudis didn’t send a higher level delegation. He tried, and was at least able to get them to begrudgingly re-establish diplomatic relations of some sort. Like I have said before, I very much doubt Saudi Arabia can ever respect a Shiite leader of Iraq while they have absolutely no respect for their own Shia citizens. The real victory was that it was held, no major security failures, and Maliki was not cornered into accepting a position on Syria that was not in Iraq’s interest. Maliki’s core base from the Shiite street viewed the summit as a success, and even Sistani who is normally hesitant to ever commend the government for anything seemed to be impressed. RV: how would you view Maliki’s strengths going into local elections in comparison to 4 years ago? In the end, the Shia vote is still fractured among the 3/4 shia parties, while Iraqiya enjoys overwhelming sunni support without really having to compete against a different sunni party. Maliki has done nothing to change that. While Nujaify has shown an independence streak, he has not broke from Iraqiya. So, as of now, Maliki is going into his next election campain without any real sunni partners. And like I have been saying before, watch out for this summer. If electricity services are bad, Maliki will be in serious trouble. The average Iraqi doesn’t give a damn about Arbil (only Allawi and Barzani do). Maliki has completely failed to address the issues of electricity, drinking water, etc.